Hey there, good-lookin’! Beauty and loyalty programs are such a gorgeous fit, don’t you think? That’s because beauty products are a necessity to many, and need to be purchased regularly. But if you’re selling the same beauty brands that are available at other stores, in-person or online, customers know they can look elsewhere based on price or a better shopping experience. That’s why, in this industry, customer retention is an absolute must. Just look at the Lancôme Elite Rewards for inspiration: their customers go crazy just to participate in the program. Stores that sell makeup, hair care, perfume and other beauty products have to be smart marketers, using tools like loyalty programs to keep customers coming back to them, instead of running off to get their products at the next store. 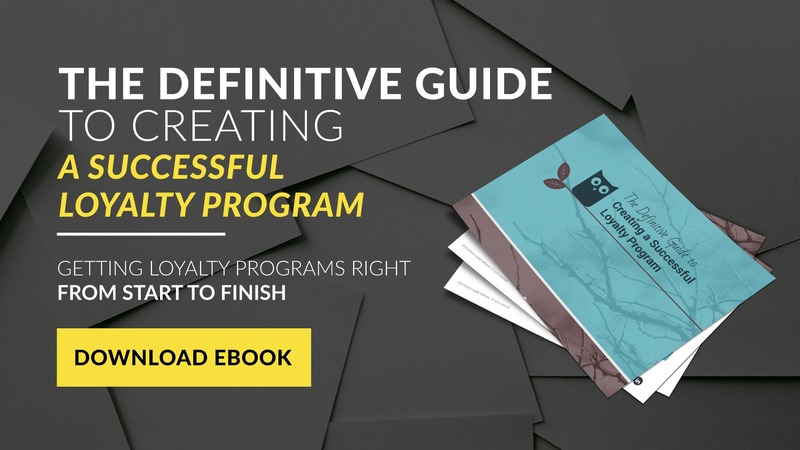 So here is what 5 big-time beauty retailers are doing with their loyalty programs – and why they’re so darn good at getting beauty-minded ladies and gentlemen to keep coming back – followed by the 8 core loyalty essentials for creating your own program! Ulta gets the top spot on my list for their “Ultamate Rewards” program. Why? I love the marketing, the setup and the personalised aspects. Birthday rewards. Double and Triple point bonuses on certain purchases. They also use point expiration and loyalty tiers in a very smart way to increase engagement. Flexibility in rewards: It’s just an exciting program, and it’s quite flexible in terms of rewards. That’s because Ulta is actually letting customers spend points as money, instead of limiting them to specific rewards. And customers are praising them for it. Smart point-expiry: Their points do expire, which can be a pain for the less-regular loyal customers. But it’s a grand idea for the beauty retailer, because putting an expiration date on points helps motivate shoppers by giving them incentive to spend their points, like, now. Sense of urgency: It’s never a bad thing when it comes to loyalty programs. Just make sure you’re giving customers a reasonable amount of time to use their points. Take into consideration how often an average customer purchases your products. For example, one calendar year may be great for makeup. However, if you’re selling travel packages or cars, one year is simply not enough. Loyalty tiers: There’s another great thing about Ulta’s program and that’s loyalty “tiers” or “levels”.The more a customer spends with the brand, the higher their status level will be. When reaching the Platinum tier, customers receive a higher amount of points for the same spend. At this level there’s no longer an expiration date on points either. Available in their mobile app: Last but certainly not least, Ulta has made their mobile apps part of the fun – it can be used to check your point balance on the go or use voice search to find the best products hands-free! 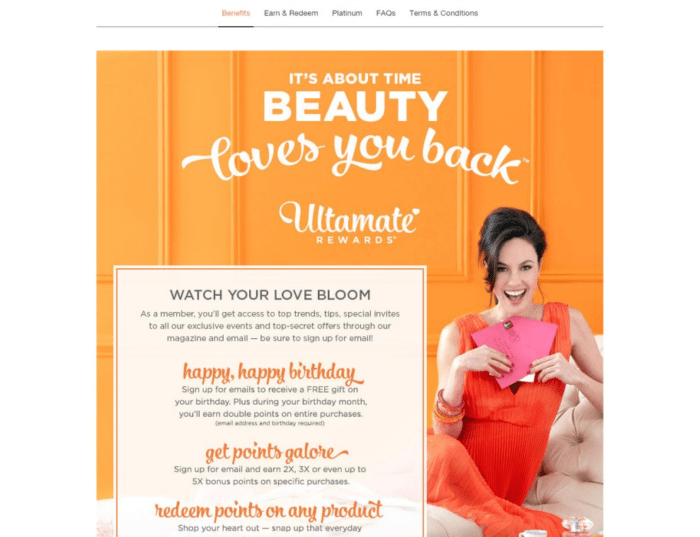 A colourful and fun landing page is how many fans of Ulta learn about their Ultamate Rewards loyalty program. Debenhams has something really nice going on. Their Beauty Club loyalty program is easy to understand and their visual explanations make it even more simple. 3 points to every £1 spent. Period. It’s great and makes calculations easy for the deal-seekers out there. Using points as a currency: They are also giving reward money with purchases, which – just like Ulta – means their customers can use their rewards as a payment option when checking out. Once again, this kind of freedom that ensures customers will get the rewards they choose. Providing a personalised experience: Debenhams has actually partnered up with a super-well-known beauty brand, Benefit, to deliver a free brow wax on customer birthdays! Now everyone with eyebrows and a birthday can rejoice! Free shipping for life: Since we’re always talking a lot about the free shipping that Amazon gives its prime customers, I just have to say Debenham’s is taking this up another notch, offering free shipping on online orders for life by simply entering a code sent in the monthly statement. Cha-ching! Bonus points: They run in-store and online events where customers can double or triple their card points, and get to their rewards faster. This is so perfect for omnichannel retailers, with brick & mortar stores and an online presence, who really want to amp up curiosity and participation. 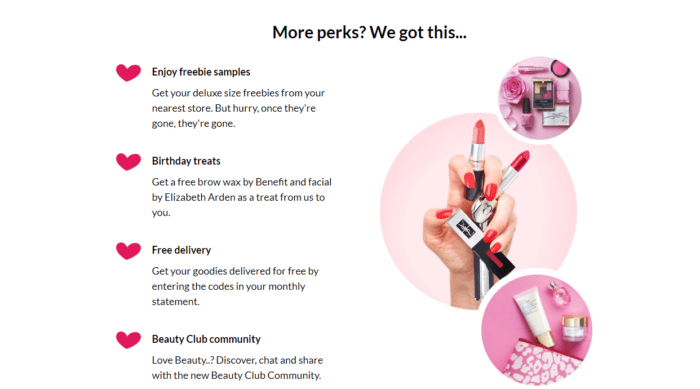 The delivery and birthday benefits of Debenhams’ Beauty Club make me, as a makeup fan, wish I was in the UK! Lancôme is doing something so unbelievably cool with their Elite Rewards loyalty program. They’re rewarding customers for spend… and way more. Incentivising non-purchase activities and offering a variety of rewards is a surefire way to please all the different customer groups you have. Rewarding all forms of interactions: If you sign up for their rewards program you’ll actually see they have a massive wall of activities to choose from to earn points, from watching their latest skincare video to writing a product review. I get particularly excited about this because engaging customers outside the buying cycle is the go-to way to make modern customers happy. Exciting incentives: In addition to the ways that Lancôme lets customers earn points, they have a massive – and I mean massive – selection of rewards to earn for and choose from. And the fun begins right after sign-up, too. So everyone can get their hands on fun rewards, like cool desktop backgrounds and Facebook cover photos. Appreciating brand advocacy: The combination of rewarding many different activities and forms of engagement, along with a huge variety of rewards, is a great way to ensure brand advocates in all budget categories feel appreciated. Never forget: your biggest brand advocates may not always be your biggest spenders. Experiential rewards: For upper-class spenders, Lancôme offers a set of exclusive experiential rewards in the form of beauty consultations with their makeup artists. They’re also offering a cool set of partner rewards that have nothing to do with beauty, such as Uber credits, spa gift cards and donations to charity. Community building: One final highlight of Lancôme’s loyalty program is that there’s an activity feed where users can see what people are doing in the program, how they are earning and spending. That lets customers see there are actually other people signed up and using the program, building a sense of trust and community. Big spenders who are loyal to Lancôme can access some brilliant and exclusive experiential rewards. So much has already been written about Sephora’s Beauty Insider program, that I’m not going to go too far into detail about it. Instead, I will stick to three things that seem to be working quite well for the mega beauty retailer. 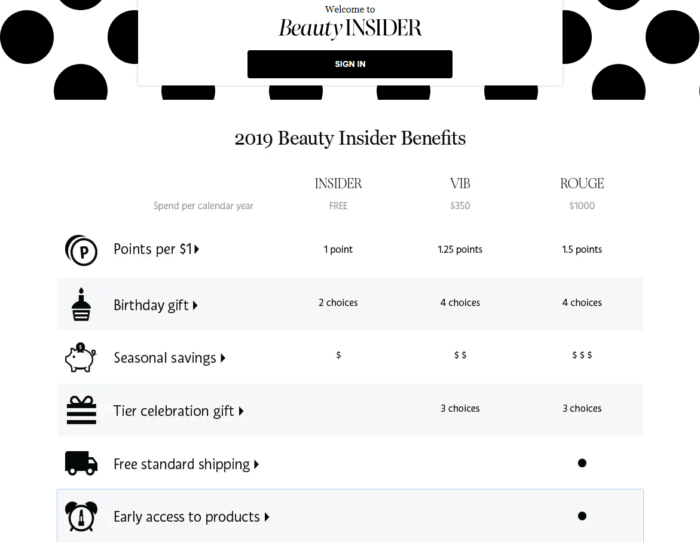 Incremental tier benefits: First of all, Beauty Insider has three different levels of loyalty membership, and I’ve got to be honest – the first level really doesn’t offer much. That’s why it’s so motivating to spend your first $350 to get to the VIB (Very Important Beauty Insider, of course) level. Exclusive rewards: My second most favourite feature is their Reward Bazaar. Just like the name implies, it’s a treasure trove of gifts and services that are only available for high-ranking members. So if you managed to reach the VIP or Rouge rank, then sigh in relief; as you are now able to redeem points for full-size products or trial samples. VIP benefits: Speaking of exclusivity, members who are in the illustrious Rouge tier are entitled to premium perks, such as free shipping or a first dib on upcoming products, currently unavailable for the wider public. This status is very similar to the Sneakers Club, the lavish special interest group of Italian luxury fashion company LuisaViaRoma. Free beauty classes and personalized gifts are a few of the perks that Sephora’s Beauty Insiders enjoy. I’m thrilled to jump over to one specific area of beauty – skincare products. An online store selling a single brand in one particular product category, like Dr. Brandt Skincare, can definitely benefit from tying loyalty and social media together to reach audiences everywhere. Promotional days: In an environment where companies are “making it rain” in product samples and encouraging shoppers to try new things, it’s particularly important for brands to experiment with point redemption. Dr. Brandt, for example, offers double points during promotional events. No point expiration: Keep the rules nice and simple. An expiration day might be a good motivation, but you need to constantly keep track of it, as well as communicate the deadlines to customers. If the collected currency is permanent, it’s convenient for everyone. 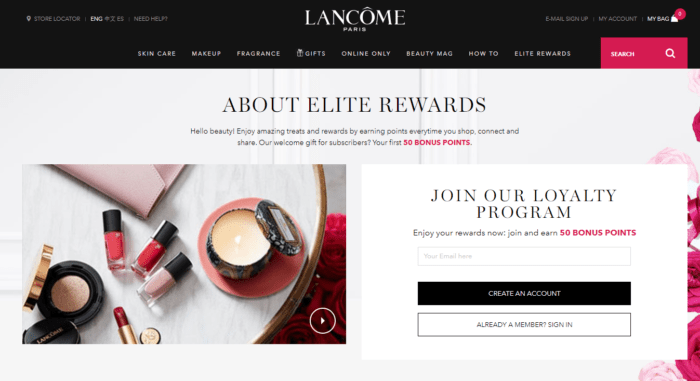 Motivate social media activity: Just like Lancôme Elite Rewards, Brandt Loyalty rewards advocacy and engagement, by offering points for referring a friend, leaving a review or signing up for the newsletter. Doing so ensures that the customer action spills over onto their social media channels. Beauty retailers selling one core brand can really benefit by encouraging customers to stick with them, and not with their competitors. Sure, these are nice. But how can I create a program of my own? These 5 loyalty programs each have unique elements, providing something that other stores can learn from. For instance, the programs reach across several channels, including social, mobile, ecommerce and in-store. Plus they provide freedom in customer action, letting customers choose how they want to earn. And they give a great selection of rewards to choose from. 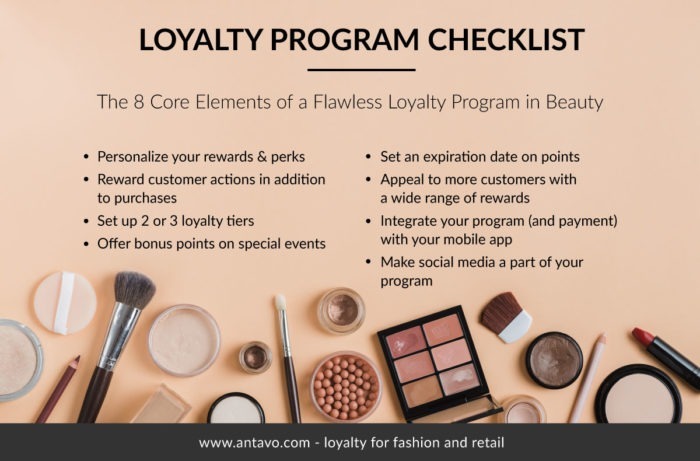 If you want to learn more, check out the Definitive Guide to Loyalty Programs and to how Antavo can help your store improve customer retention and increase customer lifetime value, book a demo. A loyalty program that’s too limited in variety probably isn’t actually rewarding loyalty. So make sure you’re not focusing only on spend, but on the overall experience. That’s what makes customers’ hearts beat for your brand! Did you enjoy this roundup? To get more great posts about retail marketing and customer loyalty delivered straight to your inbox, sign up for our newsletter. Let’s keep in touch!